2 years only. As per CSL PO Recruitment, total Available Vacancies are 36 and candidates must apply Online for CSL PO Recruitment by visiting its Official Website of http://cochinshipyard.com/. Commencement of Online Application forms is 13th February, 2017 and Closing date for Online Application forms is 28th February, 2017. Selection Process of Cochin Shipyard PO Jobs Recruitment will be through a personal Interview only which will be held at Cochin Shipyard Limited, Kochi. 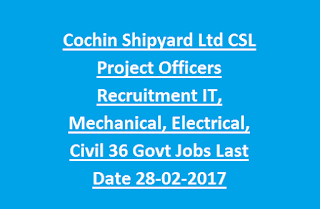 All details of CSL Project Officers Recruitment 2017, Cochin Shipyard Project Officers Jobs mentioned below. 1. Commencement of Online Application forms for Cochin Shipyard Project Officers 13th February, 2017. 2. Closing date for Online Application forms for Cochin Shipyard Project Officers 28th February, 2017. 3. Tentative CSL Project Officers Recruitment 2017 Interview date will be updated soon. As per CSL PO Recruitment, total Available Project Officers Vacancies are 36. Discipline wise Vacancies are mentioned below. 2. 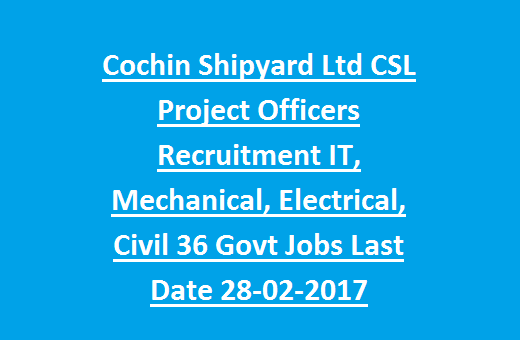 Qualification for Electrical, Mechanical, Civil, Electronics, Instrumentation Jobs in Cochin Shipyard Ltd Project Officers Jobs Recruitment 2017 degree in Electrical or Electronics or Mechanical or Civil or Instrumentation with 60% of aggregate marks to apply for Cochin Shipyard Ltd Project Officers Jobs Recruitment 2017. Candidates must have minimum 2 years of post Qualification Experience or training in relevant field as on the date of 28th February, 2017 to apply for Cochin Shipyard Ltd Project Officers Jobs Recruitment 2017 or CSL Project Officers Recruitment 2017. Maximum age limit for candidates must not exceed 25 years as on the date of 28th February, 2017 to apply for Cochin Shipyard Project Officers Jobs. There is a relaxation in age limit up to 5 years for Scheduled caste, Scheduled tribe category candidates; 3 years for Other Backward Classes (OBC), 10 years for PWD (Persons with Disabilities). For Cochin Shipyard Ltd Project Officers Jobs Recruitment 2017, selected candidates will get the Remuneration of Rs.22,000/- per month during 1st year and Rs.22,500/- per month during 2nd year and Rs.3000/- per month compensation for extra hours of work limited. Selection Process of Cochin Shipyard PO Jobs Recruitment or CSL PO Recruitment will be through a personal Interview only which will be held at Cochin Shipyard Limited, Kochi. Interested candidates may apply Online for CSL PO Recruitment 2017 or Cochin Shipyard PO Jobs Recruitment by visiting its Official Website of http://cochinshipyard.com/. Closing date for Online Application forms is 28th February, 2017.